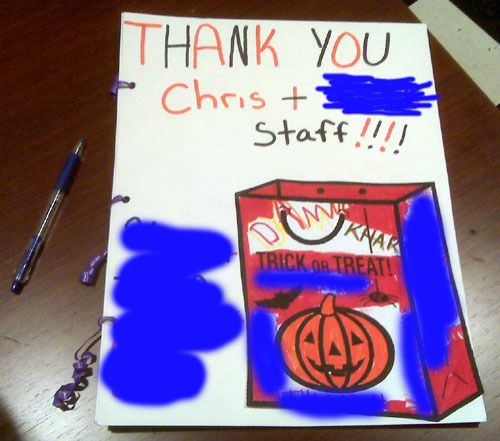 The nearby thank you card arrived at work the other day expressing appreciation for my office staff’s charitable donations. You couldn’t miss it sitting there in the lunch room. As a result, it received much more attention than the typical note card or thank-you letter. This format offers lessons for church ministries on how to show your appreciation in a way that gets noticed and paves the way for future donations. Make it big. Your thank you card won’t get lost with the junk mail and it has a better chance of being displayed where others can see it. Tap into your creative side. The personal touch reminds donors that real people are benefitting. Include everyone’s signatures. Show donors the extent of their reach. Why should your ministry go through all this trouble? For starters, of course you need to show your appreciation. But if you’re receiving donations or in-kind contributions from a company, do a little extra to remind more people at that office how they are making a difference. You want your message seen by the entire office, not just the chief organizers, so that more people have the opportunity to become aware of your group. With that awareness comes a better chance to achieve even more participation next time. It’s just one example of how to do it. What other effective thank-you’s have you seen in response to your church’s outreach?